It's what's on the inside that counts, especially when we're talking this ooey-gooey, chocolate dessert. Our version is surprisingly easy to whip up at home. Microwave chocolate and butter in large microwaveable bowl on HIGH 2 min. or until butter is melted. Stir until chocolate is completely melted. Beat whole eggs, yolks, sugar and flour with whisk until blended. Gradually beat into chocolate mixture. Line 12 muffin pan cups with paper liners; spray with cooking spray. Place 1 cookie, upside-down, in each cup; cover with batter. Bake 8 min. or until cakes are firm around edges but still soft in centers. Cool in pan 1 min. Carefully remove cakes from pan. Invert into dessert dishes; remove paper liners. Serve desserts topped with COOL WHIP. With their built-in portion control, these rich treats are good for a special occasion and go a long way on chocolate flavor. Batter can be prepared ahead of time. Cover and refrigerate up to 24 hours. 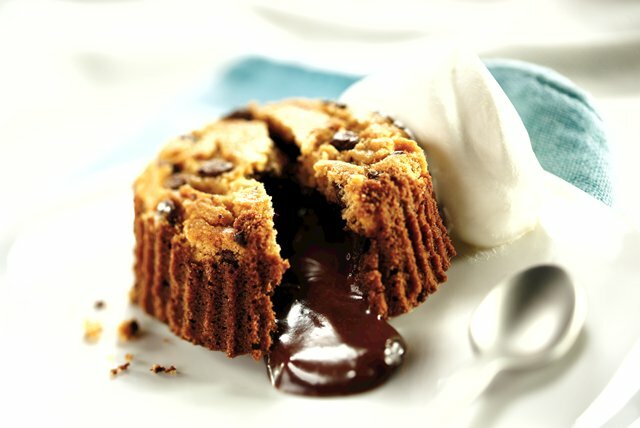 When ready to serve, pour batter evenly over cookies in prepared muffin cups and bake as directed.